Deze sampleset is normaalgesproken alleen via een download-link verkrijgbaar. Voor een meerprijs kunt u hem op een USB-stick verkrijgen. This sample set is normally only available via a download link. You can get it on a USB-stick for an additional charge. In 1647, Hans Christoph Fritzsche renewed the organ, enlarging the Hauptwerk as well. The Principal plenum of the Hauptwerk (called also the Oberwerk) is formed from his pipes today. His pipes also sound in the Quintadöhn 8', Gedact 4', Sexquialtera, and Mixtur of the Rückpositiv. Matthias Dropa expanded the compass of the instrument in 1698 and provided additional stops, especially in Pedal. His pipes still sound today in the RP Kromhorn 8', Octav 2', Pedal Gedact 8', Octav 4', Mixtur, Posaun 16', and Trometh 8'. A few decades later, the church was rebuilt and a west choir was added. Consequently, Johann Hinrich Klapmeyer (1690-1757) was commissioned to relocate the organ into a newly constructed west gallery. The organ was substantially reworked as well between 1727-1730. The organ builder added new Pedal towers and supplied the Pedal Principal 8'. He also inserted a new Brustwerk of 6 stops under the chest of the Oberwerk, and he added new reed stops to the Oberwerk:Trometh 8' and Vox humana 8'. Klapmeyer provided the organ with its present look. The organ survived until the present mostly unchanged. It was restored in 2004 by the Ahrend organ workshop. The organ consists of three manuals and a pedal: altogether 2100 pipes and 35 sounding stops. The presence of 3 independent Principal 8 stops (in Oberwerk, Rückpositiv, and Pedal) is one remarkable feature of this instrument. It is a stylistically pure instrument and emblematic of the North German organ building school. 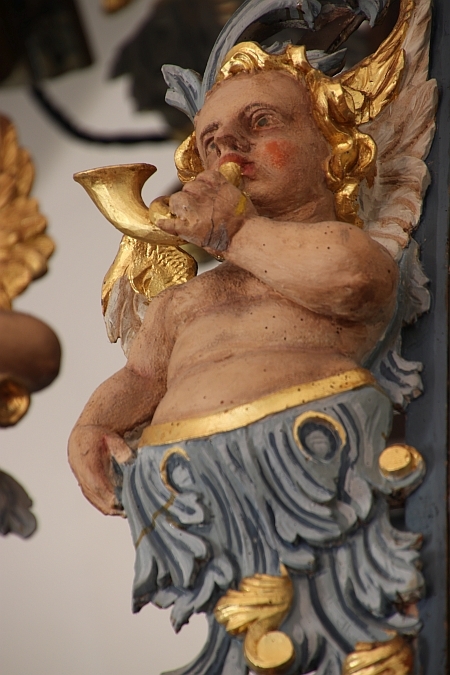 The so called Hadeln liturgy adopted in 1567 anticipated the use of the organ as a solo instrument, thus contributing to the elevated art of the organ building and organ use in the Altenbruch church. The organ is especially suitable for early North German music, such as the work of H. Scheidemann, M. Weckmann, F. Tunder, and D. Buxtehude. The samples are offered in 48kHz/24bit resolution. The multiple releases have three levels: short, mid and long. Hauptwerk v. 4.2 and higher supported. The Surround variant of the sample set is encrypted, which means that it can be used with Hauptwerk Basic or Hauptwerk Advanced versions exclusively. Hauptwerk Advanced version is strongly recommended, the Basic version is not suitable to run the Surround variant of the sample set (memory limitations, audio channels limitations). There is no use of the sample set possible in any other software. The SemiDry variant of the sample set is offered unencrypted, in plain wave format. The original compass of the keyboards is 45 keys (4 octaves, lowest short). The original compass of the pedal division is 25 keys (no low C# and D#). The compass was extended in the extended version of the sample set so that the manual compass is 4 octaves (51 keys C-d3), and the pedal bass octave was completed, so that the pedal has 27 keys (C-d1). All ranks of all the divisions were recorded with and without tremulants for the most convincing tremulant behavior. The Rückpositiv stops were recorded with the Rückpositiv tremulant (faster) and also with the general tremulant (slower). Both recorded versions of the tremmed samples are included in the sample set. However, loading the authentic tremmed ranks consumes large amount of RAM. It is possible to select to use the artificial tremulant instead to save RAM (the switch is located on the mixer tab). To load the instrument into a PC with 32 GB of RAM limit, load everything in 20 bits, except Pedal in 16 bits. Alternatively, load everything in 20 bits, but disable some not-commonly-used tremulant samples, like tremulants for mixtures of all the divisions, Untersatz and similar. Polyphony of 4000 voices recommended for the full suround (2500 pipes minimum). Polyphony of 1800 simultaneous pipes recommended for use of the wet or semiDry sample set. Klapmeyer organ, Altenbruch, 1727-1730 heeft nog geen reviews. Deel uw product ervaring en plaats een review.